The Center for American Progress hosted an event on the inclusion of transgender people in faith communities with speakers Bishop Gene Robinson & transgender advocate & Baptist Minister Allyson Robinson. During the talk a new resource was released addressing this issue. Bishop Gene Robinson, CAP Senior Fellow & author of the resource stated, “I have been personally affected by many transgender faithful—two of whom are featured prominently in this document & what I have learned is that there is nothing in the teachings of Jewish & Christian faiths that would preclude transgender people from being accepted. But it is up to members of those faiths to build transgender-inclusive churches & synagogues. 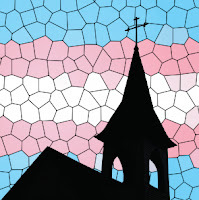 Without a better understanding of gender identity & religion, people of faith cannot hope to build the houses of worship & community it is clear our faiths require.” The resource is described in the preface as a "thank you" & a "welcome" to the transgender community with a first-person look at how faith, the Scriptures & conversations with transgender people have shaped Bishop Robinson's views on gender & sexuality & how those views of inclusion & understanding of transgender people are in line with the bedrock principles of the Jewish & Christian faiths. The debate within America's faith traditions over the inclusion of LGBT Americans has grown in recent years & many American faiths have begun to include the LGBT faithful into their communities in ways they had not in the past. However transgender people of faith are often less understood & subsequently less included in their faith communities than other LGBT Americans.